A quarter-century after the war, the German Occupation remained a sensitive and controversial issue. Melville had difficulty getting permission to shoot this opening shot of German troops on their daily march down the the Champs Elysées. Director J-P Melville and his famous dictum. 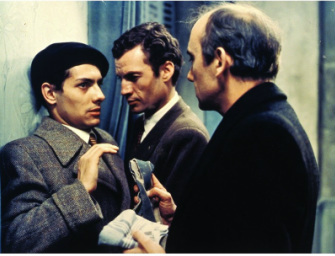 When French director Jean-Pierre Melville's movie about the French Resistance, Army of Shadows, was released in 1969, it was met with critical and box-office indifference. Its languid pace, long set-pieces, bleak tone and sombre style made it unpopular. Politically, the movie's reception was controversial and hostile. For Melville, himself a former Resistance member, had daringly upturned the conventional view of the Resistance that had dominated France since 1945 - a national movement of brave men and women unified in their determination to overthrow Nazi occupation, supported and admired by the French population at large. 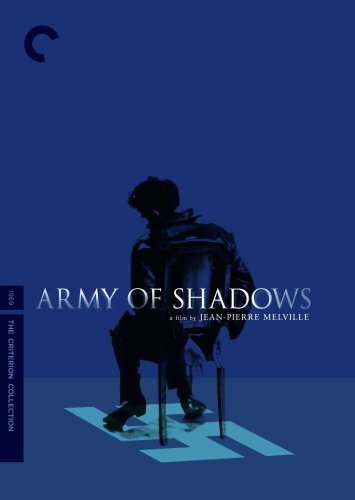 It wasn't until the end of the century - decades after Melville's death in 1973 - that Army of Shadows at last received the acclaim it deserved, and the recognition that it was probably the best film ever made about the Resistance movement. Army of Shadows is based on a novel by Joseph Kessel (author of Belle de Jour). Its plot focuses on several members of a Resistance network. Operating in Occupied France in 1942, this group spends a good part of its time desperately evading capture by the Gestapo. Unlikely incidents and objects assume life and death significance: a daughter's photo, a visit to a restaurant, a shave by a barber, a bath towel. Unlike previous movies about the Resistance, there are no spectacular raids, no explosions, no sabotage missions. Also absent are speeches about patriotism, the glory of France and the necessity of sacrifice. The plot is straightforward. It follows the activities of Philippe Gerbier, an engineer and an important member of one of the Resistance cells based in Paris and Lyons. At the start of the movie he has been betrayed by a traitor within the Resistance, but escapes and sets about tracking down and killing him. The film then follows the activities of the group as they move from safe house to safe house, trying to evade capture and coping with betrayal from within. Melville uses this slender plot to explore his favourite themes of loyalty, betrayal and personal integrity set against a corrosive background of intrigue and danger. The restricted photographic palette of Army of Shadows, with its muted and desaturated blue, green and grey conveys an ominous, even ghostly, mood of menace, ambuguity and confinement. Discussing Army of Shadows, Melville once declared that he had "no intention of making a film about the Resistance. So with one exception - the German Occupation - I excluded all realism." Athough the movie, as Ebert notes, is primarily about the state of mind of those working under extreme psychological pressure and constant danger, it is in many ways one of the most realistic of all films about the Resistance in its emphasis on the necessary details and routines of Resistance work. These range from apparently mundane aspects as arranging clandestine meetings and issuing orders, to the problems posed by new neighbours near a safe house - which leads to the issue of deciding how best to execute an informer with the minimum of noise. It also remarkably realistic and prescient for its time in recognizing that armed resistance to the German Occupation was confined to a small minority unsupported by a French population indifferent at best, and often hostile, to their activities. Many collaborated with the Occupying force. As Melville said, "Don't forget that there are more people who didn't work for the Resistance than who did." This of course was at odds with the traditional Gaullist view that most French people willingly worked to overthrow German control. He estimated that in 1940, Resistance members numbered a mere six hundred. This realistic viewpoint is vividly conveyed in the film: the small group of Resistance fighters is always outnumbered, on the run, lacking resources, pushed to the shadowy edges of French society, unable to rely on the support of most of their countrymen. And the Resistance is portrayed as riddled with informers. Most of the film's overt acts of violence are carried out by Resistance members on other members of the Resistance. This is a bleak, unsentimental view of the Resistance movement. Little wonder that the film received a harsh reception when it was first released - it attacked a long-standing and politically convenient myth about France under Nazi Occupation. However, Melville's chief interest, as in most of his films, was in examining the self-imposed codes of honor and behaviour that his main characters tried to maintain. Philippe Gerbier, like most of Melville's protagonists, (frequently thieves or gangsters) takes pride in his professionialism: the careful, studious application of personal expertise. Army of Shadows reveals Melville's fascination with the choices that people have to make under extreme pressure, and by how his protagonists accept the consequences of those decisions. What Melville admires is the stoicism, even fatalism, of his 'heroes' as they abide by their code of honor. His film is not concerned with the morality of otherwise of their actions, but with their loyalty to a particular group and adherence to a personal ethical code. "Silence of the Sea" was Melville's first portrayal of German occupation and (passive) resistance to the Nazis. 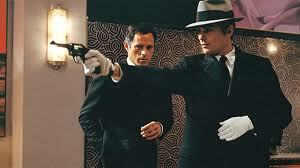 "Le Samourai", possibly Melville's best-known movie, looked at gang culture and the code of honour. "Red Circle" also examined individual responsibility and honour against a background of violence and deceit. This excellent trailer vividly conveys the mood and style of "Army of Shadows"
An analysis of Joseph Kessel's book "Army of Shadows" which Melville adapted to make his movie. Made four decades after the release of Melville's movie, Robert Guediguian 's The Army of Crime makes for a fascinating comparison with Army of Shadows. Guediguian's movie employs a much more colorful palette than Shadow's monochromatic hue, and is considerably more blood-thirsty , featuring an escalating range of violent range of set-pieces depicting Resistance attacks on German Occupation forces. Both movies depict the Resistance as weakened by internal tensions and betrayal from within. In fact, Guediguian is much more explicit in his portrayal of the pervasiveness and effectiveness of Collaboration during the war. Both movies are concerned with the corrosive effects of danger and violence on their protagonists.